Ms. Kennelly is an associate at Fiala & Weaver P.L.L.C. 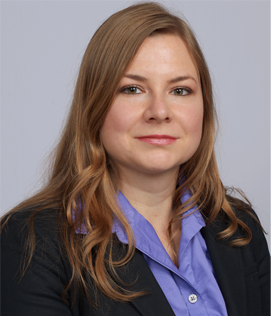 Ms. Kennelly is a registered patent attorney whose practice includes patent preparation and prosecution, as well as patent portfolio management and intellectual property counseling. Ms. Kennelly has experience preparing and prosecuting patent applications in a wide range of technology areas including: computer architecture, semiconductors, circuits, wireless devices, and system software. Her responsibilities include drafting patent applications, office action responses, and appeal briefs as well as providing strategic advice and counsel to in house counsel of various corporations. Ms. Kennelly was formerly an associate at two intellectual property law firms in Texas. During law school, Ms. Kennelly was an Associate Editor of the Animal Law Review and Editor-in-Chief of the Oregon Intellectual Property Network. Before attending law school, Ms. Kennelly worked for several years as a product development engineer at a multinational semiconductor chip manufacturer. As an engineer, she analyzed server data to identify critical product health issues; designed and debugged tests that captured silicon speed parameters and health indicators; and built forecasting models for server product yields and bin-splits at each step of the manufacturing process.